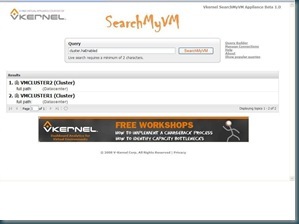 Интересный Virtual appliance - Vkernel SearchMyVM Appliance Beta 1.0. Представляет из себя "локальный гугл" :) для вашей виртуальной инфраструктуры. Скачиваем эту ВМ, импортируем, запускаем. Их пока проблематично куда то экспортировать, но скорее всего эта возможность еще добавиться. 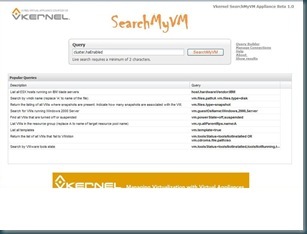 источник - A Hands On Review of SearchMyVM. * Extremely easy configuration. You can have this appliance up and running within 15 minutes. * Support for the OVF format. This cuts down the provisioning time dramatically. * Fast Indexing - Our indexing appeared to cover 500 guests and 25 hosts within 15 minutes of connecting to virtual center. 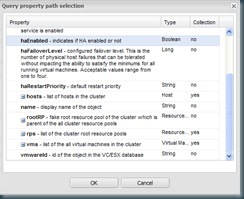 Although I was only searching for base objects like virtual machines and hosts at that time, other objects like VMware Tools status may have taken longer. 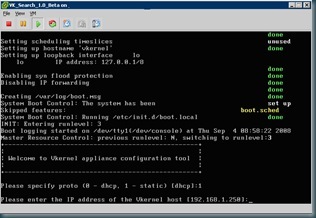 * Very well written help files and examples - I don't see any written documentation available on their website yet, but the help files contained within the appliance are more than enough to get started. 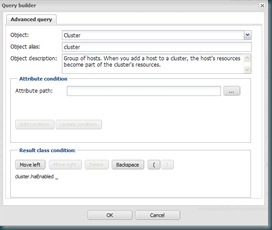 * The ability to export query results to remote shares. Being able to view query results is good, but being able to *use* query results would make this product a must have. * The ability to drill down into search results. Search results are currently static. * Plain English queries. Currently the query format is very structured, it would be nice to be able to use commands like "show vms with attached cdrom". * Support for SCVMM and XenCenter. Возможность экспорта в XML и PDF уже добавлена в версии SearchMyVM 3.0, сейчас уже доступна 4-я версия.